This is the Turtle Trax revision history for our tenth year to twelfth years. Some of the original links have been removed because the pages referred to have changed or no longer exist. Made minor updates to the archival "Show Turtles Aloha" Campaign page, reflecting changes in personnel and the new PIRO URL. Added PDF files showing visitor comments to the Laniakea page. Belatedly posted the eighth of our weekly summaries for 2006. There is also a link to all the weekly summaries from Who's Who Underwater at Honokowai. Apologies to anyone expecting it earlier. Posted the seventh of our weekly summaries for 2006. There is also a link to all the weekly summaries from Who's Who Underwater at Honokowai. Posted the sixth of our weekly summaries for 2006. There is also a link to all the weekly summaries from Who's Who Underwater at Honokowai. 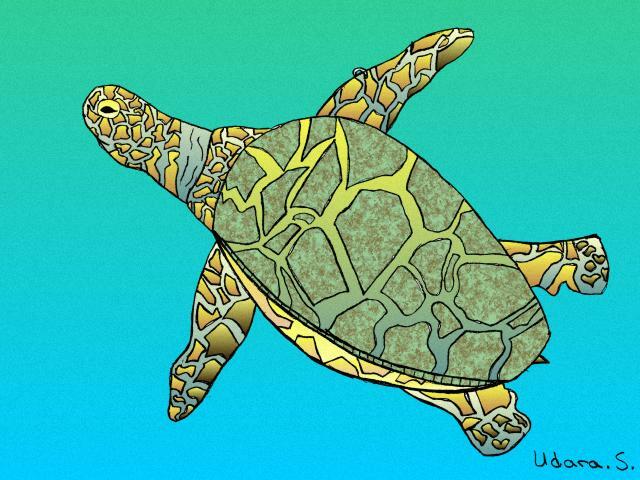 Changed references to the Hawaiian hawksbill from "honu'ea" to "'ea" throughout Turtle Trax. Although the word "honu'ea" has become common, we have it on good authority that it is incorrect. Posted the fifth of our weekly summaries for 2006. There is also a link to all the weekly summaries from Who's Who Underwater at Honokowai. Posted the fourth of our weekly summaries for 2006. There is also a link to all the weekly summaries from Who's Who Underwater at Honokowai. Added "makai," "mauka," "puka," and "Turtle Trample" to the Glossary page. Corrected minor errors in the Laniakea page and the "Show Turtles Aloha" campaign description. Posted the third of our weekly summaries for 2006. There is also a link to all the weekly summaries from Who's Who Underwater at Honokowai. Posted the second of our weekly summaries for 2006. There is also a link to all the weekly summaries from Who's Who Underwater at Honokowai. Made further updates to the "Show Turtles Aloha" campaign description to reflect the change in responsibility for the outreach programme. We're on Maui again, and so we bring you the first of our weekly summaries for 2006. There is also a link to all the weekly summaries from Who's Who Underwater at Honokowai. Updated the Laniakea page and the "Show Turtles Aloha" campaign description to reflect the change in responsibility for the outreach programme. Moved the revision for 2005 to our Previous Revisions page. Added slides about the "Show Turtles Aloha" campaign and correcting some common misunderstandings to the Laniakea page. Added a link to a column by Susan Scott and a PDF brochure about honu and the coral reefs to the Laniakea page. Added some related links to the Laniakea page. Added a photo gallery and a description of the "Show Turtles Aloha" campaign to the Laniakea page. Posted a page about the basking honu of Laniakea, Oahu and how you can volunteer to help by spending time with them. Added a link to the Watamu Turtle Watch volunteer programme to our How You Can Help page. Posted the ninth of our weekly summaries for 2005. There is also a link to all the weekly summaries from Who's Who Underwater at Honokowai. Added references to some of the latest information about the effects of fibropapilloma tumors to Sickbay. Posted the eighth of our weekly summaries for 2005. There is also a link to all the weekly summaries from Who's Who Underwater at Honokowai. Posted the seventh of our weekly summaries for 2005. There is also a link to all the weekly summaries from Who's Who Underwater at Honokowai. Posted the sixth of our weekly summaries for 2005. There is also a link to all the weekly summaries from Who's Who Underwater at Honokowai. Posted the fifth of our weekly summaries for 2005. There is also a link to all the weekly summaries from Who's Who Underwater at Honokowai. Posted the fourth of our weekly summaries for 2005. There is also a link to all the weekly summaries from Who's Who Underwater at Honokowai. Posted the third of our weekly summaries for 2005. There is also a link to all the weekly summaries from Who's Who Underwater at Honokowai. Updated our metaphorical mission statement to reflect the length of time we've known the featured honu. Posted the second of our weekly summaries for 2005. There is also a link to all the weekly summaries from Who's Who Underwater at Honokowai. Somehow managed to clobber the summary of Week 1, 2004 last week. Fixed. We're on Maui again, and so we bring you the first of our weekly summaries for 2005. There is also a link to all the weekly summaries from Who's Who Underwater at Honokowai. Added a short introduction to The Sickbay to explain that the status of FP as a threat to the honu has changed over time. George H. Balazs, or Protector of the Honu as we fondly call him, has been recognized by the National Wildlife Federation for his distinguished career in marine turtle conservation. Read the full story in Turtle Happenings. Made several corrections to our page on Threats to Marine Turtles. Thanks to Evan Kusch for pointing them out. Added the latest revisions to both the Murakawa-Balazs fibropapilloma bibliography (organized by author) and our own version, which is organized by publication. For many people, the beginning of a new year is always a time for both reflection and looking forward. It is also a time of change and new resolve. This is also true for turtle Trax. 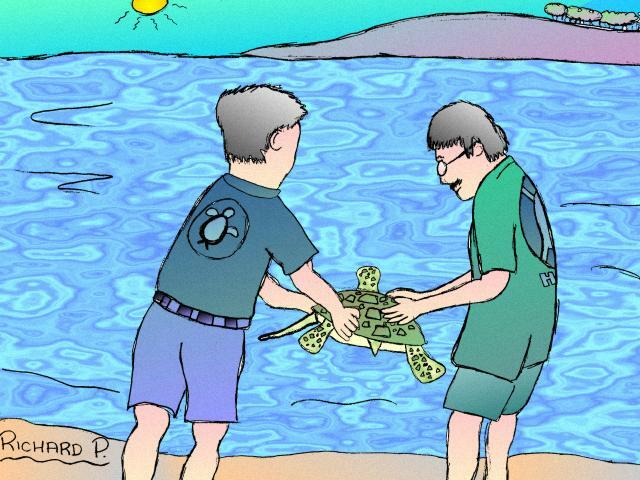 When we began in 1995, Turtle Trax was the first web page devoted to sea turtles. Since then, it has always enjoyed the enviable position of being at or near the top of the list in every web search for "sea turtle", or "marine turtle", or just plain "turtle". This has been both a blessing and a curse. 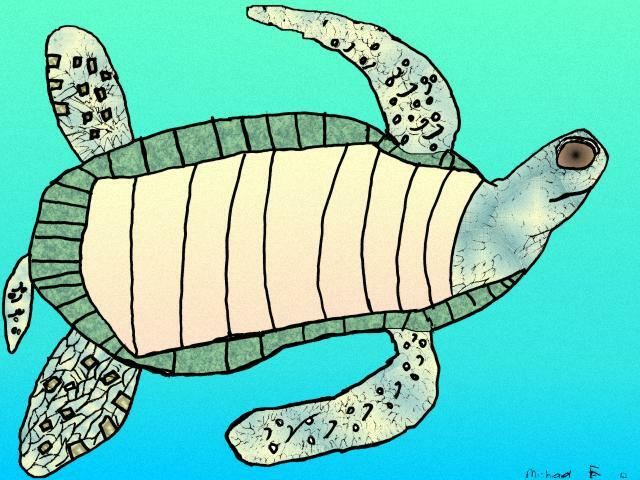 As time passed, newer and better sea turtle resources appeared on the Internet. While Turtle Trax was always unique--and we like to think it still is--much of what we provided has now been duplicated and often bettered. 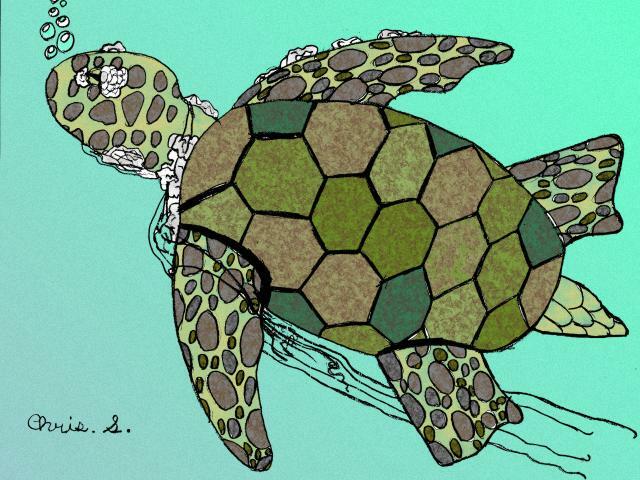 As two private individuals, our ability to keep pace with the many fine sea turtle organizations on the web has lagged. Many of our pages are in need of updating, but we have not been able to find the time to do so. So it is with reluctance that we are announcing that weekly updates are suspended. We will continue to keep Turtle Trax online, of course. In the near future, we will begin to introduce a gradual reorganization aimed at producing a much slimmer and more modern site. In the meantime, aloha and thanks for visiting. Please check back occasionally for changes. Turtle Happenings has our regular up-to-date list of links to the latest stories about sea turtles available on the web. Posted "Swimming", artwork by Matthew V., in the weekly Spotlight On Student Art. Posted "Fibropapilloma and Monofilament", artwork by Chris S., in the weekly Spotlight On Student Art. 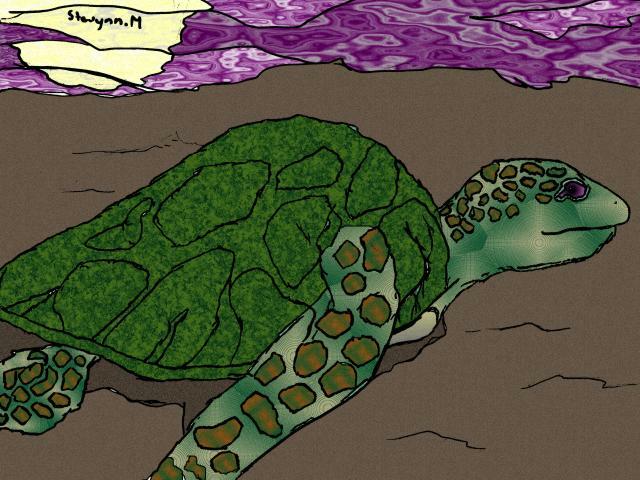 Posted "Honu Release", artwork by Richard P., in the weekly Spotlight On Student Art. 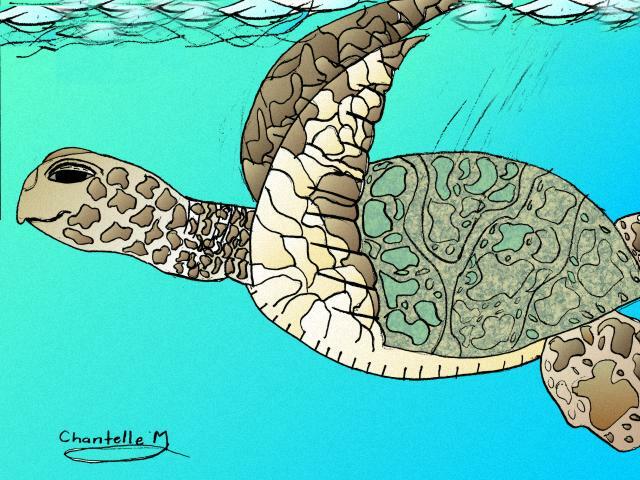 Posted "Honu Surfacing", artwork by Chantelle M., in the weekly Spotlight On Student Art. 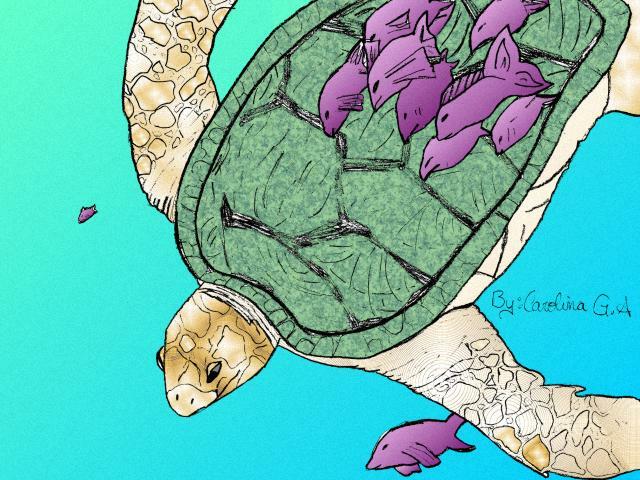 Posted "Honu Nesting", artwork by Stevyn M., in the weekly Spotlight On Student Art. Updated the biography for Ho'oulu on our Who's Who at Honokowai page. 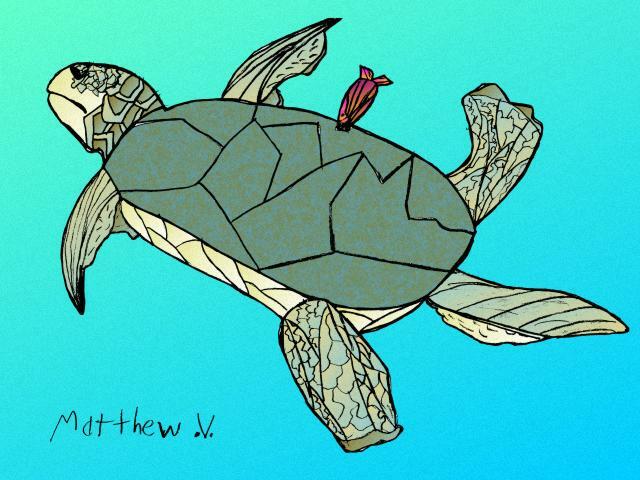 Posted "Honu in Flight", artwork by Michael E., in the weekly Spotlight On Student Art. Updated the biography for Shredder on our Who's Who at Honokowai page. 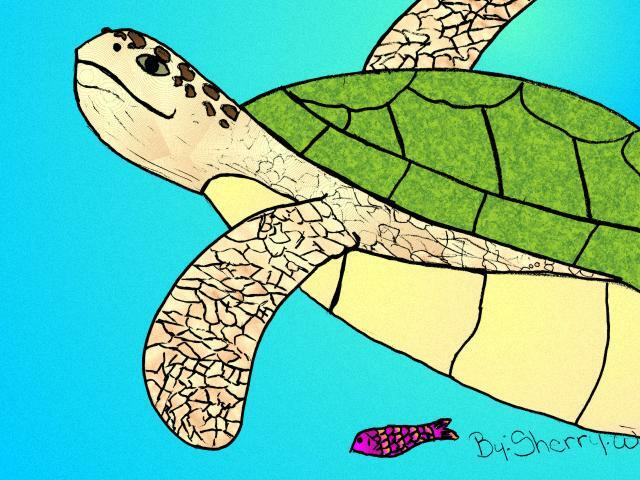 Posted "Honu and Cleaner Fish", artwork by Carolina G. A., in the weekly Spotlight On Student Art. Updated the biography for Tamu on our Who's Who at Honokowai page. 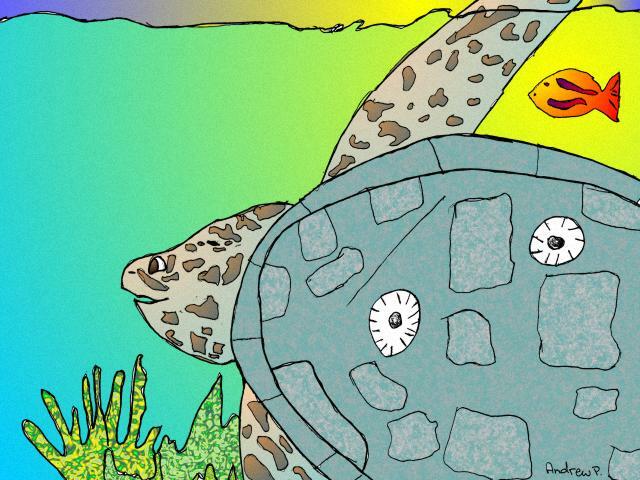 Posted "Tumored Turtle", artwork by Kelly G., in the weekly Spotlight On Student Art. Updated the biography for Kamaha'o on our Who's Who at Honokowai page. 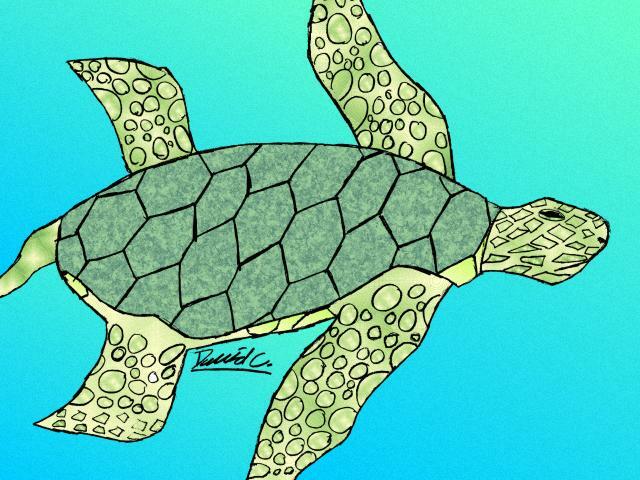 Posted "Honu Portrait", artwork by David C., in the weekly Spotlight On Student Art. Updated the biography for Tiamat on our Who's Who at Honokowai page. 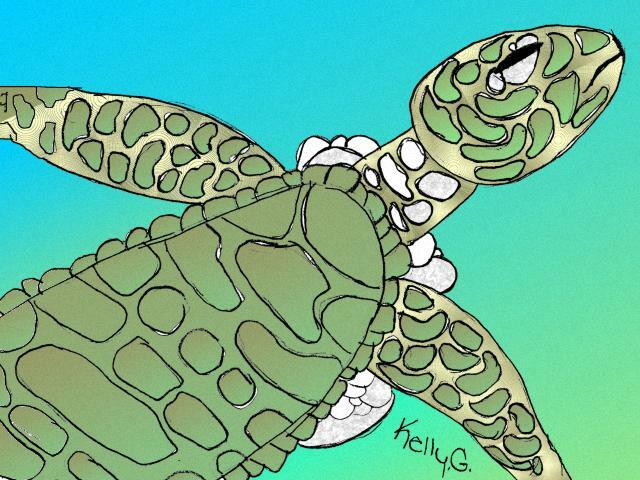 Posted "Honu with Barnacles", artwork by Andrew P., in the weekly Spotlight On Student Art. Updated the biography for McTaggert on our Who's Who at Honokowai page. Posted "In Flight", artwork by Udara S., in the weekly Spotlight On Student Art. Updated the biography for Nui on our Who's Who at Honokowai page. Posted "Swimming", artwork by Sherry W., in the weekly Spotlight On Student Art. Updated the biography for Raphael on our Who's Who at Honokowai page. Updated the biography for Tutu on our Who's Who at Honokowai page. Updated the biographies for Akebono and all of the Absentees on our Who's Who at Honokowai page. Updated the biographies for Zeus and all of the Lost Ones on our Who's Who at Honokowai page. Posted the last of our weekly summaries for 2004. There are links to the weekly summaries from both Turtle Happenings and Who's Who Underwater at Honokowai. So much happening, so little time. Lateness. Posted the ninth of our weekly summaries for 2004. There are links to the weekly summaries from both Turtle Happenings and Who's Who Underwater at Honokowai. Posted the eighth of our weekly summaries for 2004. There are links to the weekly summaries from both Turtle Happenings and Who's Who Underwater at Honokowai. Late. Well, a lot happened last week. Again. Posted the seventh of our weekly summaries for 2004. There are links to the weekly summaries from both Turtle Happenings and Who's Who Underwater at Honokowai. Late. Well, a lot happened last week. Posted the sixth of our weekly summaries for 2004. There are links to the weekly summaries from both Turtle Happenings and Who's Who Underwater at Honokowai. Posted the fifth of our weekly summaries for 2004. There are links to the weekly summaries from both Turtle Happenings and Who's Who Underwater at Honokowai. Posted the fourth of our weekly summaries for 2004. There are links to the weekly summaries from both Turtle Happenings and Who's Who Underwater at Honokowai. Posted the third of our weekly summaries for 2004. There are links to the weekly summaries from both Turtle Happenings and Who's Who Underwater at Honokowai. Posted the second of our weekly summaries for 2004. There are links to the weekly summaries from both Turtle Happenings and Who's Who Underwater at Honokowai. We're on Maui again (yay!) so here's the first of our weekly summaries for 2004. There are links to the weekly summaries from both Turtle Happenings and Who's Who Underwater at Honokowai. Added two new projects (Southern Florida and Malaysia) to the list of volunteer opportunites with Earthwatch in How You Can Help.